For those of you who fish Abel reels and those of you who have always wondered what the big deal is with such a pricey reel, Unicoi Outfitters is going to give you an opportunity to fish with their new Super 5N series. Everyone knows Abel reels are the Maserati of fly fishing equipment. They are designed and machined to the most minute of tolerances, their finishes are the most durable in the industry and their drag systems are flawless. Between now and the end of January 2010, Unicoi Outfitters is participating in the Abel Reel Challenge and will have two Abel Super 5N reels available in each store for you to borrow and fish with just to see how you like it. We'll have one spooled up for a 5 wt. and one for a 6 wt. A great feature of the Super N series of reels is FlexABELity: they can handle multiple line weights with the change of a spool. 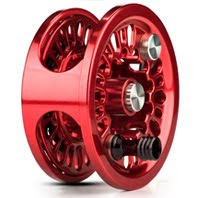 For example, the Super 5N with a large arbor spool is for a 5 or 6 wt. The same reel with a standard arbor spool handles a 7 or 8 wt. line. This provides a versatility not found in any other reel on the market. For more details on the Abel Super Series, check out this page at Abel's website. So here is the deal: You may come in and check out (just like a library book) one of the reels and fish with it. When you bring it back, we'll have a Abel questionnaire which you'll be asked to fill out. You don't have to but there is an incentive: even if you don't want to purchase an Abel reel as part of this promotion, simply by taking a few minutes to fill out the questionnaire, you will receive a free Abel ball cap from the manufacturer. If you do choose to purchase an Abel reel, if you do so within 30 days of your test drive, you will be able to get a solid color reel for the same price as a black reel, and you will receive free laser engraving of your name or initials. That's an effective savings of $100. To sweeten the pot, Unicoi Outfitters will throw in a gift certificate for a half day of fishing at Nacoochee Bend (a $120 value) when you make the purchase. These reels aren't for everyone but if you want the absolute best this is where you'll end up.